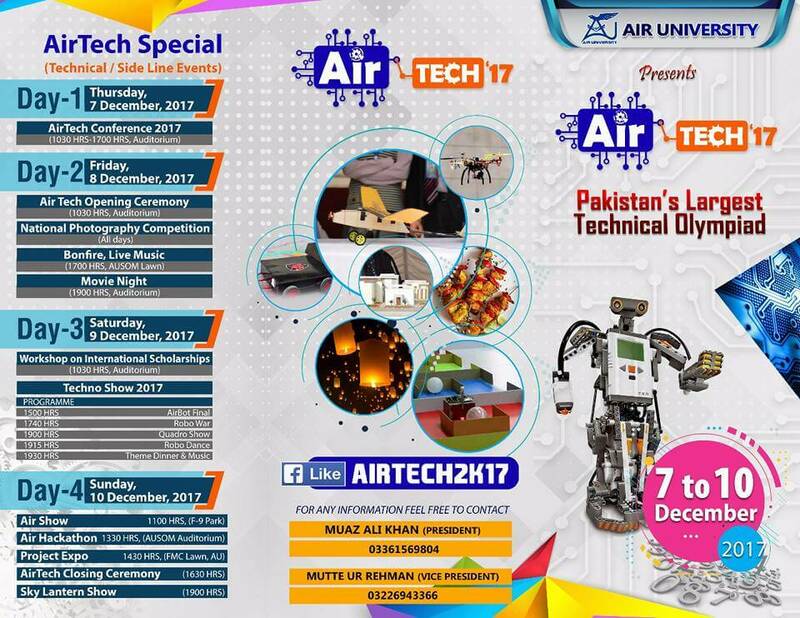 Pakistan’s largest technical and scientific Olympiad, Airtech’17 will be held at the Main Campus of Air University from 7th to 10th December. This news was announced by Air Vice Marshal (r) Faaiz Amir, Vice Chancellor of Air University, in a press conference to brief journalists about the first & the largest of its kind event. Air Chief Marshal Sohail Aman will deliver his keynote address as Chief Guest on the occasion of AirTech’17 Conference. In addition to 26 technological competitions, AirTech’17 will also feature number of value added events on sideline, which include an AirTech Conference, Embedded Workshops, a National Photography Competition, Project Expo, Aero Modelling Show, Air Techno-Show, Bonfire, Sky Lantern Show and many more. “AirTech’17 is designed to serve as a platform where a fair and competitive environment will be provided to young students to design, build & present technical solutions and perform innovative tasks in respective fields by utilizing their creative skills blended with the scientific academic knowledge and technical capabilities”, the Vice Chancellor said during the briefing. On the occasion, Ms. Fazaila Ali Qazi, Deputy Director Students Affairs also talked to the media. She told that first day (7th December) will consist of AirTech Conference where the Chief Guest will deliver his keynote address on Leadership, Education & Society Development. Various topics related to robotics, artificial Intelligence, and other emerging technologies will also came under discussion. On Day 2, student competitions which are overall divided into five key categories, such as Robotics, Mechanical, Electrical, Computer Sciences and Applied Sciences, will be held. AirTech’17 aims to enhance and polish the conceptual, analytical and practical skills and expertise of youth, with the noble intention of cultivating and nurturing their talent, thus enabling them to envision themselves to be the future of a dynamic and technologically advanced Pakistan.